Sign of a priest of darkness. 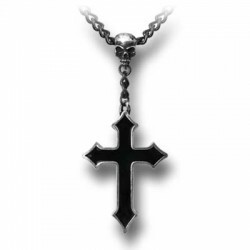 Pewter pointed cross infilled with black enamel. Suspended, rosary style from a pewter skull on a black curb chain. Overall length 17" (43 mm). Made in the UK from the finest English pewter. High quality chain and fastener.